Hollywood bombards us every day with alluring starlet’s, swank parties, and eye-catching fashion. Women across the country pore over magazines discussing the latest Hollywood trends, wishing just for one day that it could be them, living this glamorous lifestyle. Well, I have news for you….this life, or a piece of this life can be yours. What better day to make your fairytale come true then on your wedding day. The following Hollywood glam ideas will not only wow your guests, but it will allow you to truly shine on your special day. Luxury is often a word associated with Hollywood. To translate this luxury theme it is important to pay attention to your seating. Instead of using the standard banquet chair rent elegant chiavari chairs. These classic chairs most often come in gold, silver, black, or brown. Another option to disguise the run of the mill banquet chair is to use chair covers. Today chair covers come in a variety of fabrics and colors. I suggest using a silk in ivory or white with chair sash knotted in the same tone. Finally, set up lounge seating areas with couches and chairs. Placing these groupings near the dance floor will allow your guests to rest their feet while still feeling like they can partake in the fun of your reception. To achieve the Hollywood look it is important not to settle for your venue’s traditional white tablecloth. With your linens you can add style and glam. Today there are hundreds of fabrics and colors to choose from. Layer multiple fabrics, like embroidered organza with chenille or layer tablecloths with lush silks or sheer velvets. Nothing can transform your reception like great lighting. Customized lighting can change the entire look of a space. For the Hollywood look use opulent chandeliers saturated in Swarovski crystals and accent lighting in amber or gold tones. To continue with the theme I suggest using an array of candles. Not only will your reception atmosphere glow, your guests will look even more radiant under this warm light. When it is time for the dance to start, you can create a club like atmosphere with red or blue lighting. Beautiful flowers will turn any wedding into something spectacular! With a Hollywood-themed wedding, flowers are not only important, but essential. Nothing gives the feeling of lavishness and glamour than rich, bountiful blooms. To achieve the Hollywood look, I suggest using soft romantic blooms, like peonies, hydrangeas, roses, and ranunculus. Add a touch of the exotic with phalaenopsis or vanda orchids. It is important to minimize the use of filler flowers and greens to achieve the rich Hollywood theme. Finally, use a variety of centerpieces in various sizes to create tablescapes that will not only transform your reception but leave a lasting impression. The cliché saying “it’s all in the details” is definitely true for a Hollywood-themed wedding. Hollywood does not do anything half way and neither should you. I believe it is all in the layering of the details. For example, carry metallic shimmer throughout your event by incorporating mercury glass vases, napkin rings, chargers and framed photos. 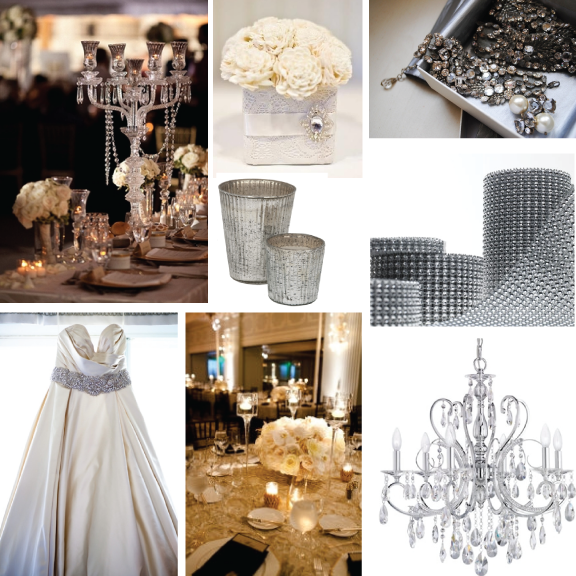 Combine these items with sparkling crystals from chandeliers, candle sticks, and beaded strands. Continue layering with accents of feathers in your bouquets and centerpieces. Finally add reflective element with mirrors strategically placed throughout your reception. By layering these elements throughout your wedding you will create a magical Hollywood event that no one will soon forget. Join our mailing list to receive new floral & wedding ideas!